After his long and successful summer in blocks of color, Jil Sander presents a collection based on the strokes in a monotone for the next Spring-Summer 2012: The looks whites are the stars next to some stamped pieces in colors like mauve. The white is a summer fashion Jil Sander and they look at the minimalist way less conspicuous where transparency and necks are closed (again) its socket. And also, white shirts, preferably with the collar at the top, if Jil Sander, the better. The look in a single color is complete the knee-high boots in the same tone, white nuclear. Look hard enough for summer, but sure many fashions take him away, before dead simple! Transparencies (very subtle) have their small space in the collection of Jil Sander Spring-Summer 2012 and what about this dress with tucks, cute! More than this we see below, with the religious or monastic figure lurking behind. If anything I liked about the collection pieces were stamped with print in summer colors, along with white, forming an ideal combo. If there is a parade that never ends that is offered by the hottest couple: Dolce & Gabbana. 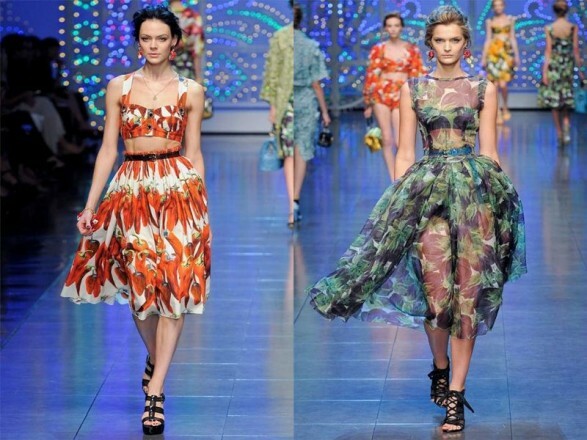 And under the framework of the Fashion Week Milan, The Italian designers have presented their proposals for the Spring-Summer 2012 next. Garments for all tastes, ages and personalities. And is that after 74 proposals there is always something you like. There are many tendencies we have, there are some that continue to govern as the previous season (the fit is presented with flowers and rhinestones applications of color) while others surprise us (If last year Stella McCartney chose lemons and oranges, this time actors are vegetables). Eggplant, zucchini, onions or peppers sheer dresses and overalls stained trousers culottes. What is the garment that goes with you? As mentioned above the vegetables have ruled the catwalk tiñiendo all kinds of garments perfect for a summer of the most colorful and original. Will we see these patterns in the firms low-cost? Sure! 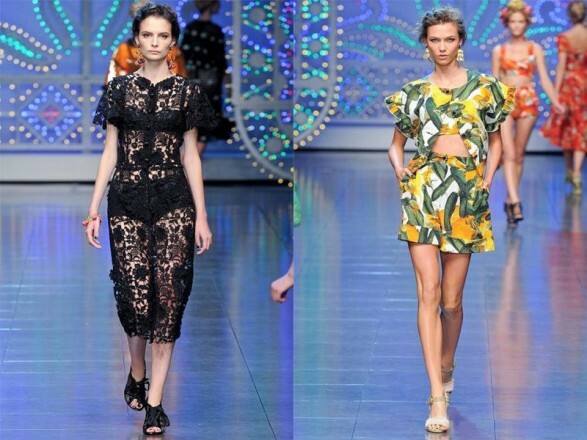 And the one thing that characterizes the collections of Dolce & Gabbana that is the lace fabric. To be more precise in black. It seems that our culture is in vogue. And is that after see the passion for bullfighting (Or rather by their costumes) of Moschino or an inspiration for the gypsies of old by Emilio Pucci, Missoni offers us ruffled dresses made in Italy. The signing of zig zag multicolor has submitted its proposals for Spring-Summer 2012 next in muted colors and unusual patterns of the firm. Flyers and fringed shawls terminated to remind us shawls Some of the garments in this collection are so peculiar. Just seeing these designs I can only imagine Margherita Missoni and Tatiana Santo Domingo with them, but another person I can hardly imagine … Who will be the first celebrity to bring some of these proposals? Found ruffles at neckline, culottes and low foothills. These will provide a Spanish air to the garment. The shawl is a fundamental part of ruffled dress and it seems that such proposals cannot miss this supplement.